the annual 'where's waldo' event hosted by our downtown main street neighbor: towne center books. -because it can be a little overwhelming also, for the little ones. and then they run to the counter all excited to get their stamp on their passport. there is something extra special about every single person who plays this game..
but these two caused a little extra melting of my heart. -not quite the height of our counter, so it was partly in the way they had to reach up..
-those sweet faces; sweet voices..
and then.. I gave them each two butterfly stamps in the ricks picks square. And then asked if they also wanted a stamp on their hands. and smiled so big. and said "thank you!" 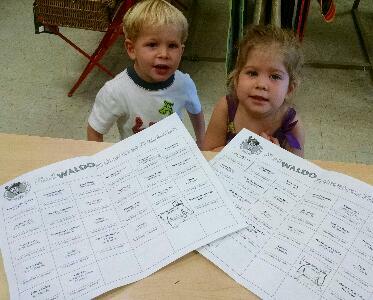 without their nanny even having to prompt them..
Well, she couldn't seem to figure out how she could admire the butterfly stamp on her hand and hold the where's waldo passport paper at the same time. So she handed the paper to her nanny. and my confession here is this: " me too!". -honey, I am nearly 50 years old and have never lost my joy for the simple pleasures of a stamp, or a sticker.. I love stamping these passports and stamping the kids hands.. I wanna stamp everyone who comes through the door..
and close here with a big "thank you!" To Anne.. Because at first we were each just initialing the boxes with a pen..
but she brought the butterfly stamp and ink pad. and if you could see the smiles.. -for such a very inexpensive, simple thing..
-talk about return on investment! -and so I have recommended we keep a stamp at all times; forever! Even after the event ends..
because even for the kids who aren't participating in the game.. when you offer to stamp their hand.. Immediately transforms their experience at the cash register and they leave with a smile..
how much was this stamp and ink pad? I think, when you evaluate from a purely business stand point. we are way outshining some place like... Safeway.. Where the kids can have a free cookie..
plus, -this is not a sugary snack that some parents want to avoid..
it doesn't harm your teeth, or ruin your dinner..
and who ever gets the stamp, smiles. The person giving the stamp smiles. anyone standing in line, witnessing the smiling children, also smile..
that's like, 5 smiles for every 1 stamp..
~very good business in deed.